The Identical Three Crows is a candlestick pattern indicating a bearish reversal. It is a special case of the Three Black Crows pattern. The difference is that in the Identical Three Crows, the second and third black days open at the closing level of the previous day. A marginal gap is also possible. How to recognize Identical Three Crows? 1. Three long candles resemble descending stairs. 2. 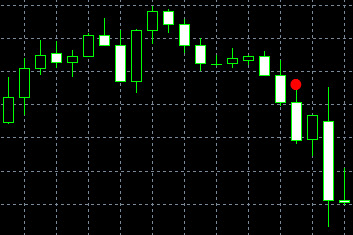 The opening price of each candle can be equaled to the closing price of the previous session. The model points to panic sell-offs in the market. The price suffers extra downside pressure. The closing price of each day makes the opening price for the next day. The Identical Three Crows pattern is a sign of weakening purchasing power. This model is not flexible as it is a particular case of the Three Black Crows. The Identical Three Crows is a type of the Three Black Crows pattern.